Immediately following Presi­dent Obama’s State of the Union 2015 speech, Vice President Joe Biden landed in California and headed to West Los Angeles Community College (WLAC) to address, promote and propose the president’s plan to waive the first two years of tuition costs for full-time and part time students who maintain no less than a 2.5 grade point average. When introducing Biden, Congresswoman Karen Bass (CD-37) further supported Obama’s proposal, stating to her constituency, “We need to change our mindset when it comes to K-12 education. Now it needs to be K-14 and I believe VP Biden believes it needs to be K-16”. With lite laughter, Bass made it very clear to the audience that this day marked a kick off for her district to champion the policies outlined by the president in the SOTU, get them passed through the House, the Senate and on his desk. Nabil Abu-Ghazaleh, Ed.D, president of WLAC was less worried about the cost of college fees and more concerned over the most pressing needs like the cost of living in CA and support for students who need home care, child care and housing. Regardless of an individual’s economic background and lifestyle impediments, Biden spoke with high optimism about “gigantic opportunities” and the U. S. being the first nation in the world to have twelve years of free public education. Although, America may lead in various areas of wealth and influence, his agenda did not outline the resuscitation of a suffering infrastructure to ensure the delivery of quality education. However, the grit effect came into play when Biden made it impossible for constituents to ignore the consequential outcome and current conditions of an uneducated and ill prepared nation unable to fill 100,000 open manufacturing job positions. This statement pierced the private room with a reality check. This is also a wake-up call for Black America to become more sophisticated, informed and educated when it comes to taking advantage of job training programs created to increase the probability for advancement and placement in STEM industries at community colleges nationwide. “We know 12 years is not enough…we’ve invested nearly $4 billion in competitive grants since I have been Vice President to community colleges. 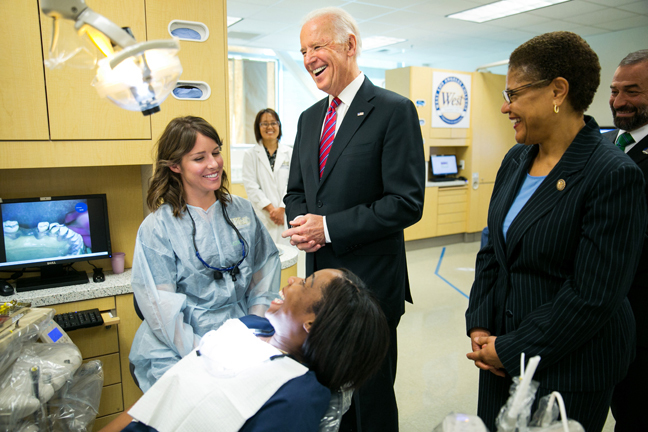 Community colleges are the most flexible educational instrument we have in the nation,” said Biden. For more information about the Free Community College Plan go to, www.whitehouse.gov.